NOTE: OUT OF PRINT. DIGITAL EDITION ONLY. On the occasion of the 45th anniversary of the Attica rebellion, we are offering free access to a seminal interview with Michel Foucault following his visit to the prison (follow link in the table of contents below). 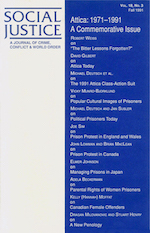 Our classic 1991 commemorative issue, now available in digital format, provides a retrospective on the Attica rebellion, an assessment of prisoner struggles in the United States, Canada, England and Wales, and Japan since 1971, and thoughts on a new penology for the 1990s. It is of enduring historical value.